And so another Fed day arrives. As of the time of writing, the famous pre-FOMC drift has yet to materialize, with equities (ex Valeant) doing very little, and on low volume. This is perhaps another example of the Heisenberg Unprofitability Principle, which states that you can profit from a market anomaly or publicly disclose it, but you can't do both at the same time. Valeant longs, meanwhile, are just hoping for Schrodinger's Dead Cat bounce so that they can escape with a bit of their money (if not their dignity) intact. As for the FOMC, only 4 of 98 economists in the Bloomberg panel are calling for a rate hike, which with this Fed means the chances of one are close to nil. Much as Macro Man might wish for the days when the Fed had the capacity to deliver genuinely hawkish surprises, time is clearly better spent pondering what the committee will do rather than what they should do. If we check out a panel of key indicators, we see that 2/3 of them have improved since both the January and December meetings. While this would ordinarily suggest another rate hike at this point in the cycle (given that both pillars of the dual mandate saw improvement, most particularly inflation), the more interesting considerations are what it might mean for the statement and the somewhat tiresome charade of forward guidance. It seems likely that the Fed will leave the door open for a move in the relatively near future, perhaps as soon as April. The key question is whether that door will be ajar or gaping wide open. Two of the indicators the street will look at in this regard will be the statement on the balance of risks and the dot plot. In December, the statement characterized the risks as balanced. In January, the reference to the balance of risk was eliminated altogether. Based on the panel displayed above, it would be hard to argue that the risks look any worse than December, particularly with regards to the dual mandate. That being said, a number of Fed speakers have highlighted inflation expectations (and the downside risks they present), thereby adding yet another entry to the laundry list of excuses not to go. On the other hand, the Fed are a bunch of academics, many of whom subscribe to a Phillips curve view of the world. In that vein, the ongoing resilience of the labor market coupled with an uptick in core inflation might suggest more inflation on the way, as Fischer hinted a week or two ago. As such, characterizing the risks as balanced or nearly balanced looks the most likely option, which would keep an April hike firmly on the table. 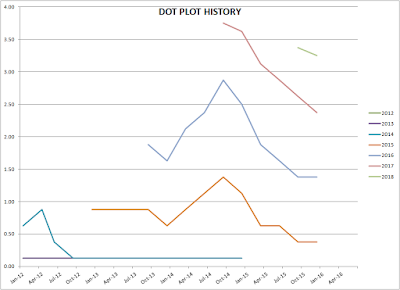 As for the dot plots.....well, to be honest the dot plots are just complete rubbish at this juncture. They only seem to exist to provide an excuse to be marked lower, thereby generating "free accommodation". While that's not technically true (the dots were marked higher during the taper, and lower as soon as it ended), it still captures the vast bulk of the shifts since the introduction of the device. Put another way, the Fed are like that terrible market strategist who always has the same 1 year forecast regardless of price or fundamental shifts. 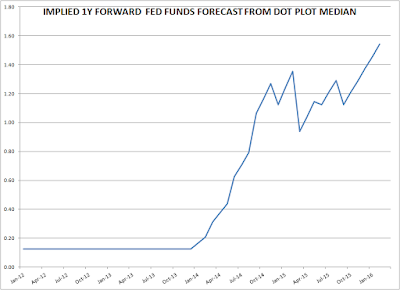 After all, the Fed has been forecasting the 1 year forward Fed funds rate to be above 1% consistently since September 2014. Needless to say, we're still waiting. Naturally, we can expect the dots to be marked down again, at the very least eliminating March from the four hikes that had previously been implied. Would it come as a surprise if the Fed got rid of 2 hikes for 2016? Not all all, if you've been paying attention. Even though the rates market is only priced for one, it would still find a way to rally on this development. Dots further out will also get marked down, but frankly the whole thing is such a farce that Macro Man cannot muster the energy to care by how much. 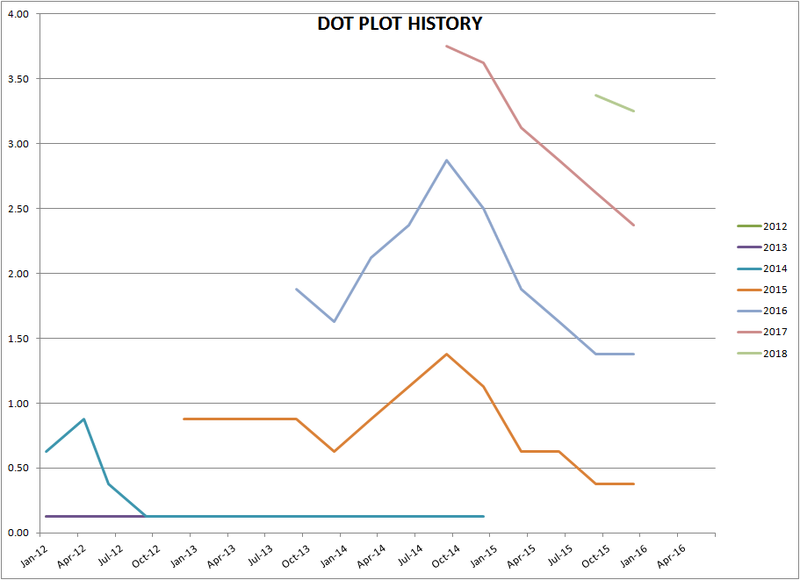 After all, they'll only get knocked down again in June, anyways- these days the only thing that goes down more regularly than the dots is Valeant. As for the economic projections, it seems likely that the inflation forecasts will have to be marked higher, though not by too much (because then the Fed would need to explain why they hadn't moved rates!) Frankly, the evidence suggests that the best thing that they could do to generate inflation is to maintain a pessimistic forecast. Finally, Macro Man cannot resist providing at least one small normative comment. The Brainerds of the committee seem to spend a lot of time worrying about the risks posed by China, the risks posed by Europe, the risks posed by inflation expectations, etc. Well, what about the risks posed by low rates? The Fed, after all, has a tremendous record of allowing financial imbalances to occur during periods of accommodative policy...imbalances that have a nasty way of ending badly. 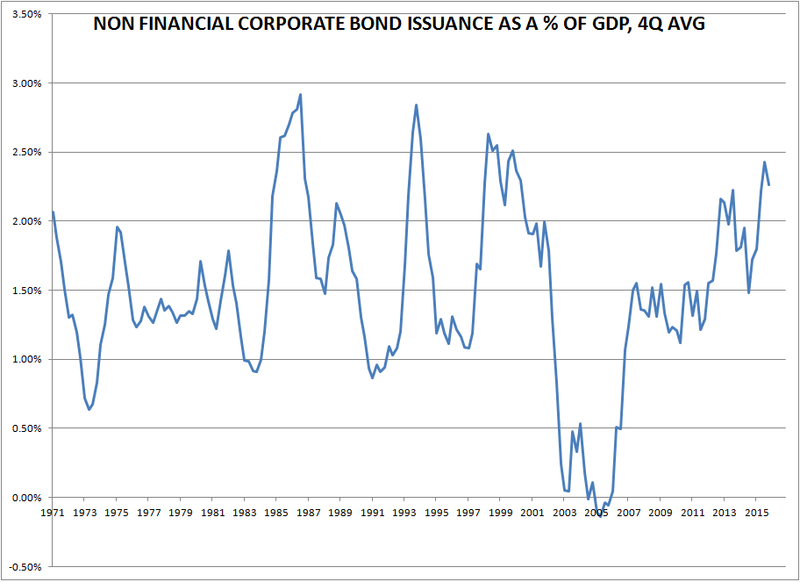 Nonfinancial corporate debt issuance has been robust, to say the least....while we've already seen the poo hit the fan in the energy patch, is it really in the best interests of long term financial stability to encourage corporates to become addicted to issuing debt at such low yields, particularly when the proceeds seem to be going into buybacks rather than investment? Well, apparently that's someone else's problem....let's leave it to the macroprudential folks to sort out, eh? That way the Fed can focus on the proper dual mandate of US monetary policy, namely the SPX and RMB. Valeant -- so much wrong wrapped up in one company. Financial engineering vs. creating value, rigging the numbers, etc. They are going to zero, or if they don't, they will be radically different by the end of the story. How many of the SOBs close to that POS are going to end up in jail? My guess is that it rounds to zero, on a scale of zero to 1. To MM's general point, it might be hard to figure out what law was really broken. But this kind of crap goes on all the time, and one would hope there was a way to stop it. It doesn't actually follow that everybody needs to go to jail, but "insert rage statement here". I think they'll lose just one dot. After all, they don't want to be "out of ammo". They want to leave as many dots on the table as they can, so they can lose them at future meetings. By the way, just noticed that GAAP earnings on the Russell 2000 have just turned negative. Having watched the p/e balloon from about 300x to 600x in the last couple of weeks, the data on the WSJ website went missing this weekend - I assumed an error had been found. But no, it's now back with an explanatory blaming GAAP rules for a negative result due to accounting for "one off items". The risks from low rates are huge and arguably they contributed to the last 2 bubbles (tech 2000, subprime 2007, ?current one). Not difficult to see the Fed as serial bubble blowers, possibly due to an institutional bias for asset inflation. The negatives from the hangover (of excessively low rates) seems to outweigh any minor benefit, but they keep doing it anyway ! I wonder if the dollar corrects further here despite a commodity rally and increased inflationary fears. Booger, what is the current bubble ? There is no euphoria around so how will a "Burst" Occur ? Or are you just referring to Asset valuations only rather then sentiment ? No opnion about voting for him, but since he is likely to be the republican candidate it makes sense to analyze, like the ignorant fed, what will happen and not should. Re Anonymous - "where's the bubble?" I would say there has been a widespread global investment bubble - in nearly everything from oil, mining, softs and production. Rates were drastically cut to get away from a Depression and kept them there, so we now think of it as 'normal'. Trouble is, the CB's may (I only say may) have inadvertently caused massive over investment in possibly everything with not enough demand to use it. A Depression is characterised by a loss of pricing power - this can either be achieved in the short run or we can put it off by lowering the price of money and get our loss of pricing power via the route of over investment. Now, a small fall in demand is equivalent to Buffett's water going out and we see what it reveals. The needs are there, but the wherewithal is not - that requires either more balanced trade or a fiscal response. @abee "So is trump good or bad for markets ?" I think he creates volatility and noise but I honestly can't find a signal, probably because there isn't any. Collectively, the main message arising from the race so far is a soft bipartisan consensus to protect domestic workers better, which is negative for both bonds and stocks, but specifics depend on how its done - obviously raising the minimum wage to $15 has different implications from a massive infrastructure spending bill that absorbs construction workers. Anon 10:48, I was channeling Hussman and referring to general valuations. He has been saying that for the last 6 years. But I think it is reaching a more interesting point with earnings rolling over. It looks like we are forming a slow rolling top on SPX. I guess sentiment changes slowly. The sentiment in 2007 would have been 2014, if 2016 is to be 2009. Abee: whether Trump gets elected or not, he is starting to have an effect. Clinton has pledged to place more tariffs on Chinese steel imports ?
" frankly the whole thing is such a farce that Macro Man cannot muster the energy to care by how much." Agree, MM. The observer comes away from watching the central bank,umm, in action and wonders if it wouldn't be easier just herding cats. One thing occurs to me...that each Fed chairman, I think due to the mishandling of policy, gets his/her reputation besmirched earlier and earlier. Greenspan was for a while at least the "genius" who had figured out the way to avoid disaster, because he was an "expert" on the GD...but Janet, poor Janet, she's in over her head from the start. Consensus?? Booger, what is the current bubble ? 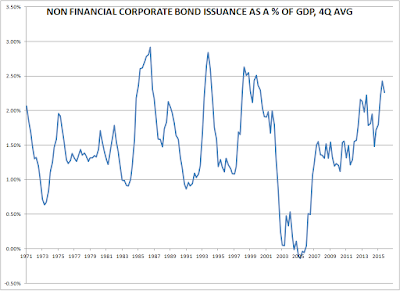 ...The current bubble is debt/credit. This manifests itself differently in Brazil than in China, differently in the US than the EU, differently in developed countries than the BRICS, differently in government than in individuals...but it is the same cat no matter what brand of stripe he's wearing..
Not very pretty, is it? @Anon, that depends on your perspective! What are the transitory effects that have been pushing up inflation recently? Rent? Healthcare costs? Yellen said there are some, but she is not giving details. 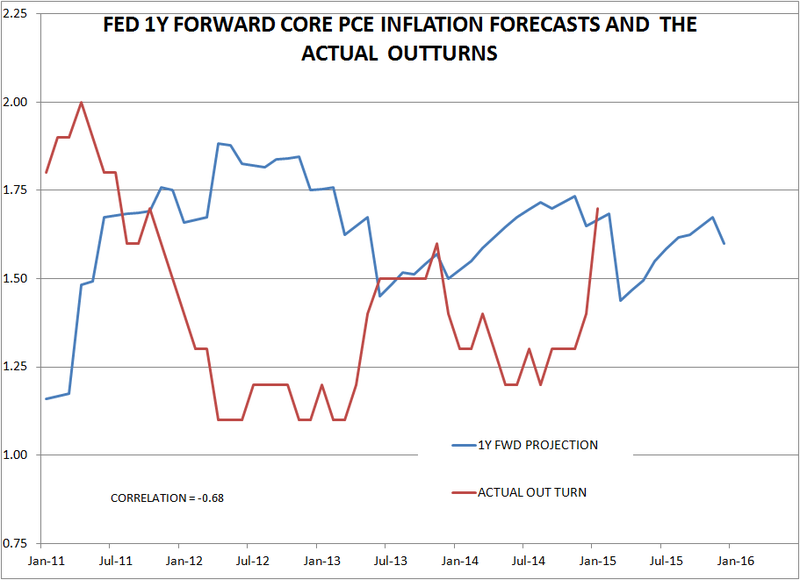 It seems really strange to expect inflation to be 1.2% for the year if oil bottoms and core PCE is running above 1.7% (see Cleveland Fed forecast). I am baffled by this and it seems others at the press conference are too. She has lost the plot. They are total frauds. Told ya... equities go up. I am glad I am not the only one that thinks so. Some campaign trail rants make more sense to me than her gibberish today. I missed the presser, whats so shocking ? Whoa - MM found his inner Trump. They finally get the dollar (interesting coming at the heels of the G20 meeting) has whats changed, but they don't want to say that they f@#ed up back in Dec. So yes, come to think of it, frauds sounds about right. MM - beginning to get the fall '98 feeling (the famous post LTCM Greenspan cut) here - would you talk me out of it before I mortgage my house to sell long bonds? MM - Would you expect economists to slate her for this view? @MM: Let the hate flow through you. You must purge your sense of what must be as a result of the data, and instead look at CBs as political institutions. My turning point was Bernanke moving the goalposts on when he would end QE3. IMHO, the Fed's decision to back down today is a political decision to keep the markets steady through the election. More Dovish fuel for the dollar which helps support commodities. Equities junkies say thank you for another hit .. I've never really seen a hawkish fed so I guess why should I expect to see one now. @ Anon 7.20 check out @IanShepherson on Twitter. Not impressed. @ Anon 7.21 But Janet Costanza said that the Fed apolitical! Yeah right. I don;t know what's worse- that they're this dishonest or this incompetent. Well, if the assumption that Janet is doing Hillary's bidding is correct, then it probably will hike in the second half of the year (Sep/Dec). USD is on the soft trend and inflation is going to be up. So the next mid-term trade should be short USD and long everything else, till this fall I guess. DAX must be loving that EUR tommorrow. Agree with anon 7:21 that CBs are more politically driven than "data driven" institutions which would go a long way explaining why despite lowering UE and rising inflation, through new excuses important items (i.e. those that are rising) from inflation indices get undermined. Re Trump despite the "agressive" aka. non PC statements it's very hard to believe he would be stupid like MSM tries hard to depict. A complete moron wouldn't have probably made such a fortune excluding inheritance which isn't the case. It's just he doesn't really care and acknowledges that all politics today are a complete joke so why not make fun of it. It seems a lot of voters agree with that and are voting just to disrupt the old status quo (which IMHO might not be a bad thing). He isn't in it for the lobby or campaign money anyway. Changes: maybe taxes would go down and central government/bureaucracy get cuts which all things equal should be more stimulatory than not, though the free trade plans might get scrapped. With establishment candidates there won't be a whole lot of change in anything. The lack of change from time to time creates potential for new candidates offering real change, be it better or worse. 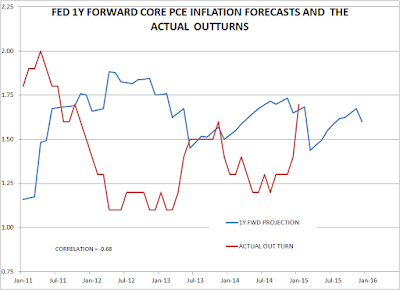 Kocherlakota in a Bloomberg View article just said that the inflation projections are goals rather than projections. Are you saying that this no decision makes you think the,uh, recovery will probably look like this when we hit the 10 year anniversary? 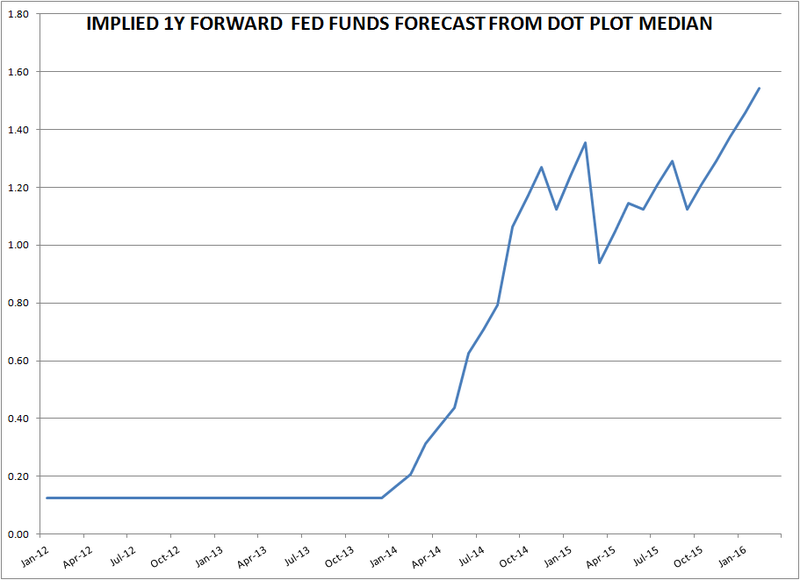 Are you giving voice to the Fed's inability to acknowledge the mal-effects of ZIRP? Are you just hoping to return to a normal Adam Smith-type of economy? ....Nah. I didn't think so. Please pass the sharp stick so I can poke you in the eye. On politics, about Trump's policies, all I can get is that he would accelerate the rising of inflation, reducing immigration and trade war will push up prices first. I am not sure if those policies can increase employment later on but betting on a hawkish Fed for 2017 and 2018,or even the end of 2016 should be a good idea. Equities could rally till next earning season. So short USD still seemed to be a better trade for me. March 16, 2016 at 8:04 PM × This comment has been removed by a blog administrator. March 16, 2016 at 8:05 PM × This comment has been removed by a blog administrator. MacroMan, since you're cleaning up you can remove the comment from anon 7:49 PM as well. Down market for a couple of weeks after the options expiry this Friday, through to the quarterly expiry at the end of this month. Then, on April Fool's, we'll resume the post-February 11 rally ... how appropriate. I already bought all the dips and now I am out of money. What should I do? Anon 10:21 - If you'd "bought all the dips" in spoos you'd be up several hundred points. I think we can ascertain that you did not in fact do so, but rather just typed facetious comments here. Anyway I think it's past your bedtime. Goodnight. March 23, 2016 at 5:59 PM × This comment has been removed by a blog administrator.